Northern Track and Field events are for senior only, but athletes of 15 and above are OK to compete. The events are frienly affairs, and provide a low risk, easy way of trying track and field events. Each team has up to 2 athletes per event, and points are awarded for final positions. As well as athletes, we need marshalls, time keepers and helpers on the day (they get a free packed lunch). For more information please contact Pat, Simon or Stuart. This year Chorley will be hosting an event, so will need extra help on a day sometime in August. Chorley Athletic & Tri hosted the Northern Men/Women Track and Field Div 4W Match at Preston Sports Arena (Uclan). The last meeting for 2012 saw 15 athletes and 9 officials achieve the Club's best performance for a number of years, finishing in 2nd place lifting them up to 5th position in the Division. 3 Outright wins, 2 by Anya Townsend in the 1500m and Javelin and Adam Sciacca in the 5000m together with 20 personal bests were recorded. Women - 100m Holly Ainscow 4th A Eluned Smith 2nd B - 200m Holly Ainscow 5th A - 1500m Anya Townsend 1st A - 4 x 100m Relay Eluned Smith/Holly Ainscow/Anya Townsend/ Kath Townsend 2nd - Discus Anya Townsend 3rd A Eluned Smith 2nd B - Javelin Anya Townsend 1st A Holly Ainscow 3rd B - Shot Holly Ainscow 4th A Eluned Smith 2nd B Long Jump Eluned Smith 2nd A - Triple Jump Eluned Smith 3rd A Holly Ainscow 1st B. Men - 100m Andrew Ramsey 3rd A John Wright 3rd B - 200m Luke Betts 2nd A John Wright 3rd B - 400m Ryan Sciacca 3rd A John Wright 5th B - 800m Ryan Sciacca 3rd A Marco Sciacca 3rd B - 1500m Shaun Coathup 5th A Simon Townsend 4th B - 5000m Adam Sciacca 1st A Morgan Lowe 4th B - 4 x 100m Relay John Wright/Andrew Ramsey/ Shaun Coathup/Ian Gouldthorpe 3rd - 4 x 400m Relay Luke Betts/Ryan Sciacca/Adam Sciacca/Shaun Coathup 2nd - Hammer John Wright 5th A Bolu Olufon 4th B Discus Ian Gouldthorpe 4th A Jonothan Betts 6th B - Javelin Jonothan Betts 6th A Marco Sciacca 7th B - Shot Ian Gouldthorpe 3rd A Andrew Ramsey 3rd B Long Jump Ian Gouldthorpe 2nd A Bolu Olufon 1st B - Triple Jump Ian Gouldthorpe 3rd A Morgan Lowe 2nd B - High Jump Ian Gouldthorpe 4th A Adam Sciacca 1st B In all a group of excellent performances! Squad (dirty bakers dozen) : Laura, Eluned, Kirstie, Anya, Bolu, Adam, Ryan, Fergus, Anthony, Ian, Rick, Marco and Simon, supported by Stuart, Pat and Kath. Ian Gouldthorpe had a great day at the North of England Track and Field league event in Stockport. 1st in triple jump and a hatrick of 2nd places in Discus, High Jump, Long Jump, plus good points in numerous other events. Over the longer distance, Adam Sciacca achieved 2nd, 3rd, 3rd in 1500m, 800m and 5000m. Brother Ryan took 4th in the 400m, and father Marco 2nd in the Javelin B. Ever improving Bolu Olufon struck a 3rd and 2nd place in the 100 and 200m races. Anthony Carter and Simon Townsend ran in very hot conditions for a 4th place each in the 1500m and 5000m respectively. Injured sprinter turned thrower, Rick Cordwell racked up some useful points with 4th, 6th and 7th places in Discus, Shot and Hammer. 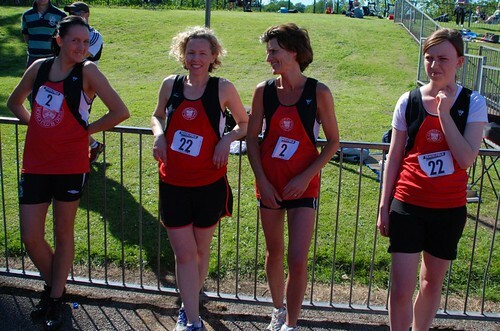 Four ladies competed in a wide variety of events. Laura Livesey managed a 2nd and 3rd place in the 1500m and Discus. U17 Anya Townsend took a 2nd place in Javelin, and 2nd in the Long Jump B final. Eluned Smith competing for the first time achieved great results, with 2nd, 2nd, 3rd and 4th places in Triple Jump, Javelin B, Long Jump and Shot. Kirstie Tallon took a good 2nd in Shot B final. For the first time in many years, the ladies had a team (Laura, Eluned, Anya, Kirstie) in the 4x100m and 4x400m races, where, running for the first time, they achieved superb 5th and 4th places; which also matched the mens (Bolu, Adam, Ryan, Fergus,Ian) team results.